For those of you who drove into the event, you were greeted by marshallers wearing luminescent rain suits (the weather was a bit dreary), and flashlights to ensure you safely parked your car. As you made your way into the Epps Terminal Building, you were greeted by Pat Epps and other Epps employees where you obtained your name tag. Then you found your way into the main Epps Hangar which was practically devoid of aircraft and was filled with a large stage with a jumbo tron screen. Our Master of Ceremonies was Jack English, an accomplished film director and aviation aficionado. 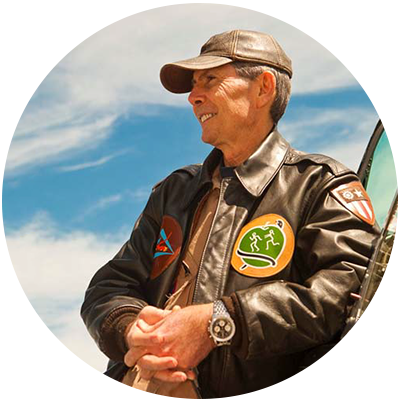 Jack summoned Pat to the stage and recounted Pat’s amazing journey as an aviation entrepreneur, explorer and pilot. People who had been a part of Pat’s life also appeared on the stage and gave testimonials. In the midst of this on-stage performance, an airshow was unfolding. DeKalb Peachtree Airport was shut down. The B-17 named “Memphis Belle” was starting up and being piloted by John Hess. With light rain and overcast skies, John got the B-17 started which attracted a crowd. In no time at all he was airborne for several passes over the airfield. With the return of the B-17, the crowd had to wait awhile for the departure of the Aeroshell Formation Aerobatic Team. Just as the sun was setting and the airport was becoming dark, the Aeroshell started their engines, and the four AT-6 aircraft taxied for Runway 21L. Aeroshell lead and No. 2 took off in formation followed by Aeroshell 3 in formation Aeroshell 4. In no time at all, they were over the airport forming up as a four ship and made a series of aerobatic passes over and around the runway. These included a barrel roll, a loop, a starburst, and what one would refer to as a squirrel cage, that is, the aircraft performing loops in a concentric circle at the same time. Observing this formation flight at night with smoke coming from the four air- craft flown in formation was quite spectacular. At the conclusion of their performance, the Aeroshell pilots taxied before the crowd, did a 180 degree turn, blowing smoke which is the customary completion of their performance. As one looked about the hangar during the course of the celebration, one could see Don Brooks, the owner of the B-17 Liberty Belle and the sponsor of the B-17 Memphis Belle, Ray Fowler, who flies the Memphis Belle and a number of other Second World War aircraft, Richard Taylor who was Pat’s sidekick during the Greenland expedition where the P-38 Lightening Glacier Girl was recovered, pilots, aviation lawyers, adventurers and even an astronaut (Gene Cernan) were present for this magnificent event. Pat’s children were also in attendance and honored their father during the course of the evening. The Epps Air Service 50th Anniversary celebration may be the first time and the last time that Peachtree DeKalb Airport is closed for an exclusive airshow performance as part of a celebration. Only Pat Epps could pull off such a remarkable achievement. The next time you are in Atlanta at Epps Air Service, drop by Pat’s office and give him a word of thanks for his contributions to aviation.